Actors were not slow to see the advantages of the new medium of film - a wider audience and increased income - despite the warning of the American dramatist and producer David Belasco in 1919, that "once a moving picture actor, always a moving picture actor". Great actor managers like Sir Herbert Beerbohm Tree , Frank Benson and John Forbes Robertson invited the cameras to film them in their famous Shakespearean roles, despite the fact that their verse speaking would not be heard. The spectacle was the thing. The introduction of sound in Britain in 1929 was a significant factor in the preponderance of photographed stage plays which appeared throughout the 1930s. As dialogue became more important so did actors trained to speak it. All the major film studios were situated close to railway termini and also to London's West End, which enabled actors to film during the day and appear in the theatre by night. In America, the major theatres and film studios were mainly located on opposite coasts with a whole continent between them, so that actors specialised in one medium or the other. British players such as Jack Hulbert and Cicely Courtneidge , John Gielgud and Jessie Matthews , Gerald du Maurier and Gertrude Lawrence , could encompass both media with ease. Film producers attended all the theatre first nights, looking for their next star or subject. British actors were trained to erase all vestiges of a regional accent and so they all tended to speak in the same way. Whether playing dukes or dustmen they remained, in Peter Ustinov 's words, "elegant understaters, immaculate actors of the du Maurier school, who were able to play anything... without their assumed characteristics in any way being allowed to affect their performances". This is certainly true of John Gielgud and Jessie Matthews in The Good Companions , but not of Edmund Gwenn , who successfully adopts a Yorkshire accent and persona in the same film. West End theatre audiences wanted to see their glamorous selves and way of life represented on stage, and this class stylishness was reflected, in turn, on the screen in Lord Camber's Ladies (d. Benn W. Levy, 1932), Jack's the Boy (d. Walter Forde, 1932) and Cuckoo in the Nest (d. Tom Walls, 1933). 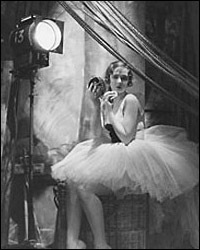 1930s stage and film output was not only about glamorous nights. Social and political issues were being explored in Hindle Wakes (d. Victor Saville, 1931), The Good Companions (d. Victor Saville, 1933) and Juno and the Paycock (d. Alfred Hitchcock, 1930), where actors, writers and directors strove for greater realism and turned the spotlight and the camera on the working and the under classes.